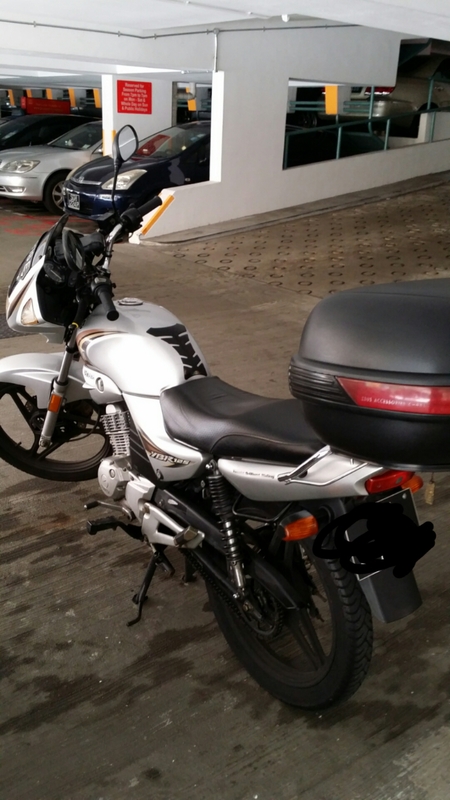 I regretted selling off my 6 year old Yamaha YBR 125cc in Jan 2015. It was left in the carpark collecting dust. I couldn’t even start the bike due to flat battery. When someone offered to buy it at $3K, I was too glad to let it go. No sooner had I sold off the very well taken care bike, I deeply regretted it. In Jan 2016, I acquired this Honda Wave 125cc after much scouting around. The COE will expire on 19 April 2017. Even though I was driving taxi everyday in my previous life, I still feel compelled to ride my ride once in a while for the fun of it especially if I need to get to a place fast. From the age of 19 yrs till now, I have never stopped riding a motorcycle. I’ve driven no less than 8 bikes in my lifetime. This old bone shaker could be my last bike before calling it a day when I’m too old to ride anymore. Of course, I’ll need to renew the COE at $3.2K for another 5 yrs or pay $6.4K for another 10 yrs! I’m still considering the available options. But first, I had to do up the bike. When I bought this nearly 9 year old bike at $1,800, it needed some fixing up especially the front wheel alignment which is a little out. When I test drive the bike, I found that the engine was in tip top condition. It was smooth and easy with the throttle. 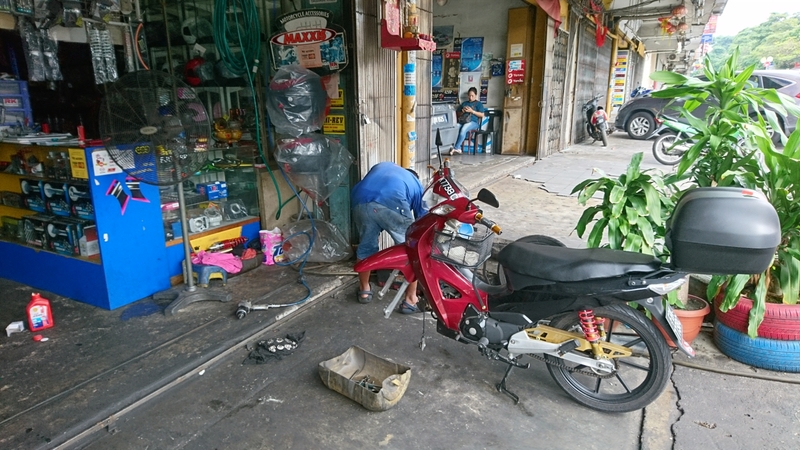 The owner had changed many things such as both tyres and the bike cover-set. He told me that he had the clutch plates changed too. The price I paid for this bike is slightly higher than the market price but I was satisfied with its overall performance. Since I was driving taxi almost everyday, I did not really ride the bike much. It’s parked in the carpark most of the time. I only rode it on weekends or in the nights after my day shift taxi driving. I’ve asked a few motor shops whenever I passed by in my taxi to enquire about the front wheel alignment. Almost all of them quoted me between $100 to $150 to get it done. I also had to leave it in the workshop for a couple of days. After returning my taxi on 2 Feb 2017, my first priority was to go to JB to fix it. 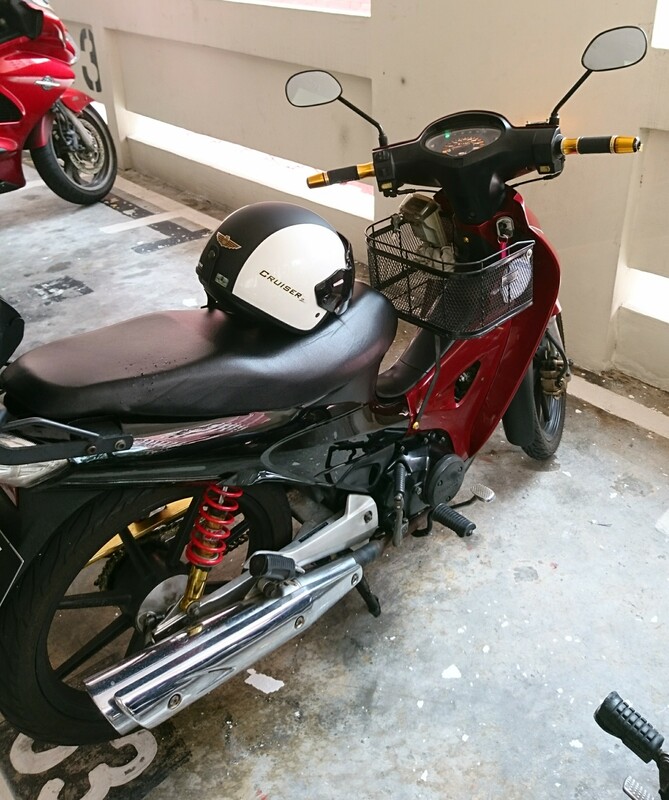 Soon after I acquired this bike, I told Douglas of my intention of going to a workshop in JB to fix the problem. 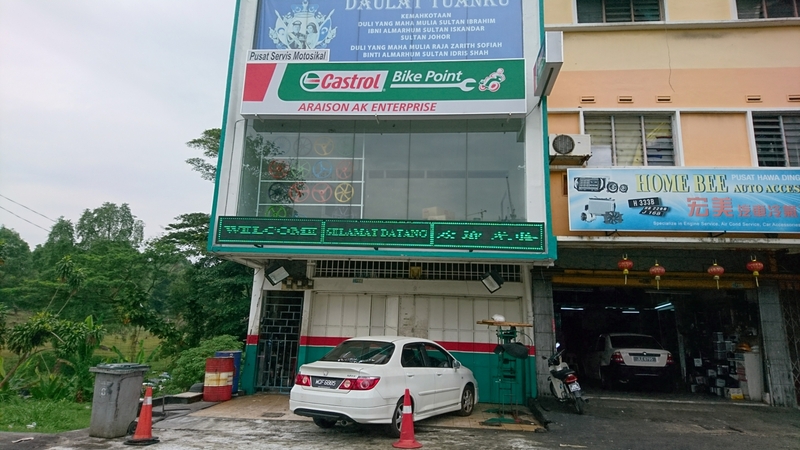 Douglas asked his security officer from JB and the latter recommended a workshop in JB with quotations to change the front fork. That was more than 1 yr ago. At last on 9 Feb 2017 (Thu), @0930 hrs, I managed to ride my bike to JB. It was a smooth ride with no jam across the border which took me about 30 mins to reach the checkpoint. 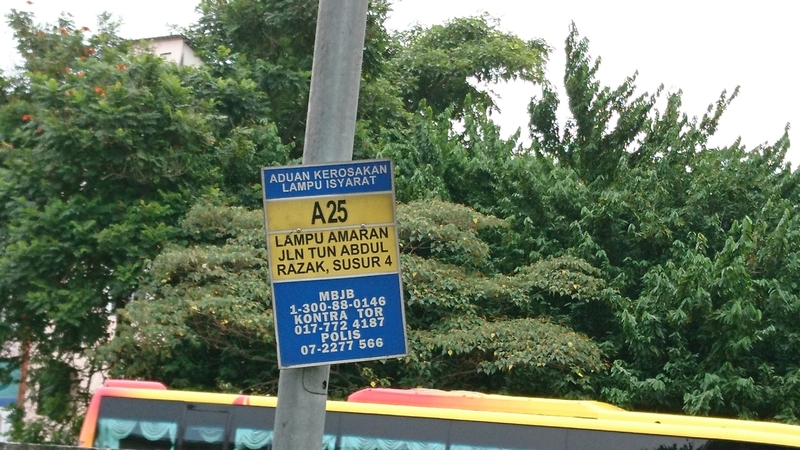 Once I crossed over to the other side, I simply asked some of the bikers around how to get to the workshop at Jln Tun Abdul Razak, Susur 4? Just entered via the centre road inside the tunnel (just after the Msian checkpoint) and follow the road all the way to the highway. “When you see Danga City Mall, keep left and filtered out. At the traffic junction just after you filtered out turn right and keep left. After a short distance, just turn in to the slip road and you should be there!”, that young Malaysian biker instructed me in Malay. I managed to locate the said workshop but it was closed. 10.30am the shop is closed? 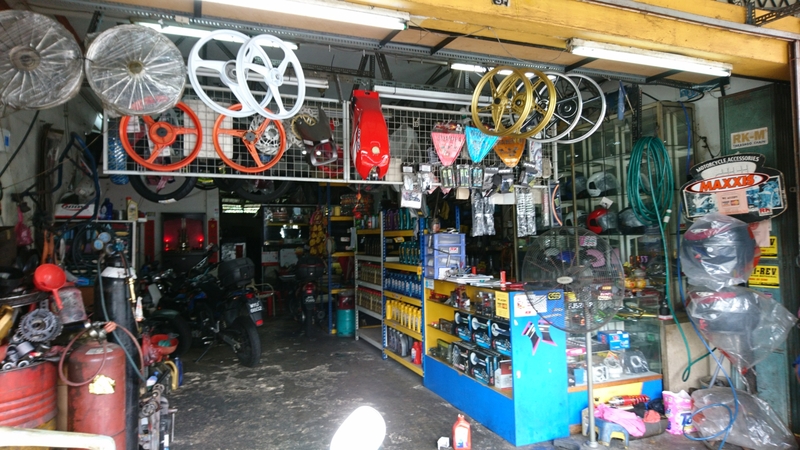 Later I found out that the owner of the workshop is an Indian and that day was Thaipusum. Oh dear, I didn’t realize that. 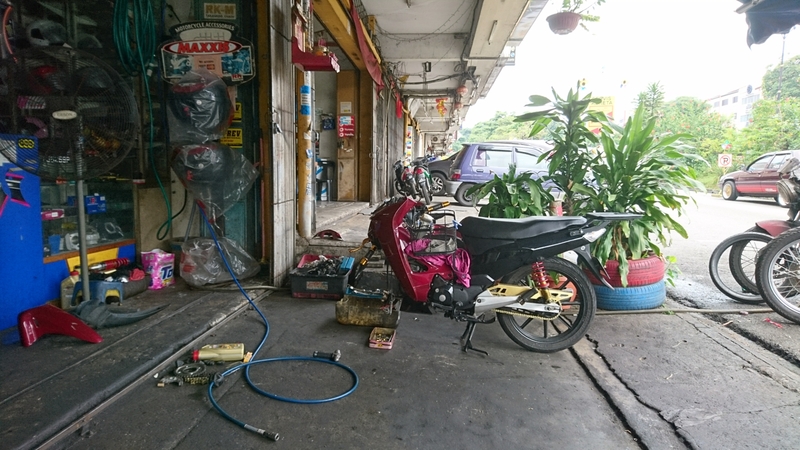 When I was wondering what to do, one middle-aged Malay mechanic from the next door workshop in overalls greeted me with a wide smile. I explained to him my bike problem. Without a word, he took over my bike and rode off before I could even protest. He came back after a while and started rattling off his assessment of my bike in Malay. Luckily, I could understand what he was saying. Basically, he told me that my bike’s out of alignment not to due to the front fork. Even if he were to change the front fork, the same mis-alignment would remain. It’s actually the top part of the fork that needed to be “pressed” to align it back. He had to dismantle the entire front fork assembly and send it to another specialized workshop to straighten it. That would take about one hour! He also told me that the engine of my bike is in excellent condition. 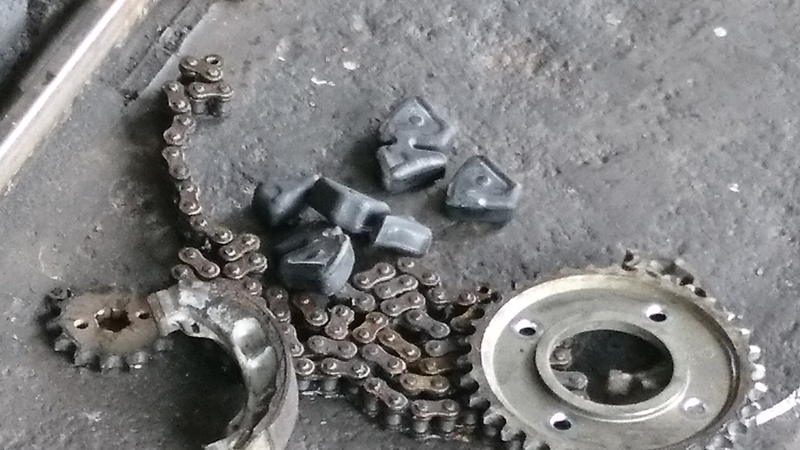 Maybe, I just need to change the sprocket & chain set. 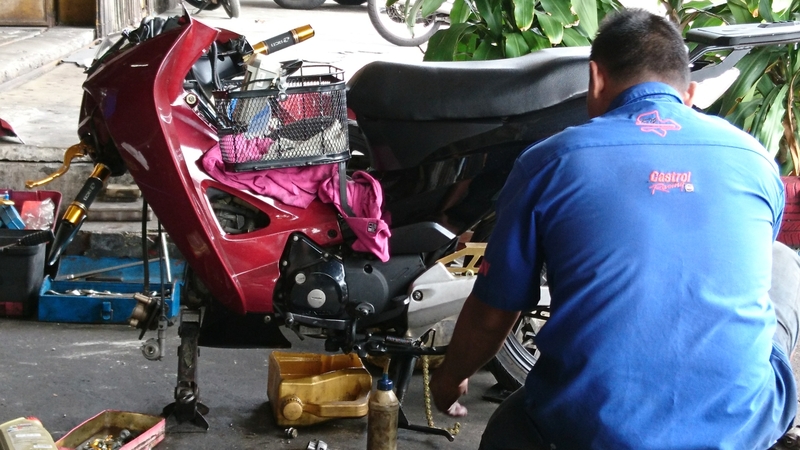 Since that Indian workshop is celebrating Thaipusum, I had no choice but to let that friendly Malay mechanic from the next workshop handle my bike. I did the following on my 9 year old plus bike. Total is RM268. Convert to Singapore Dollar only $85! Just alignment of front fork here will set me back by more than S$100! 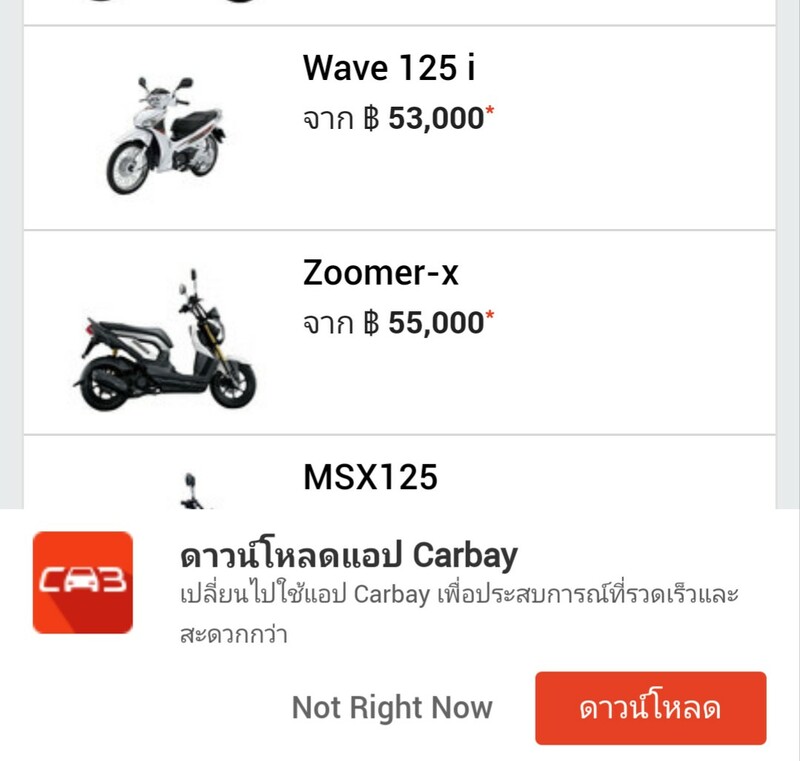 With only S$85, I could do so many things for my bike! When I was waiting for my bike to be repaired (about 2 hours), I ordered a packet of Nasi Lemak wrapped with fresh banana leaf and newspaper with fried fish, cucumber plus hot chilli washed down with a hot glass of ginger Teh Tarik at the road side Sarabat stall. When I called for the bill. Only RM3. Less than S$1! 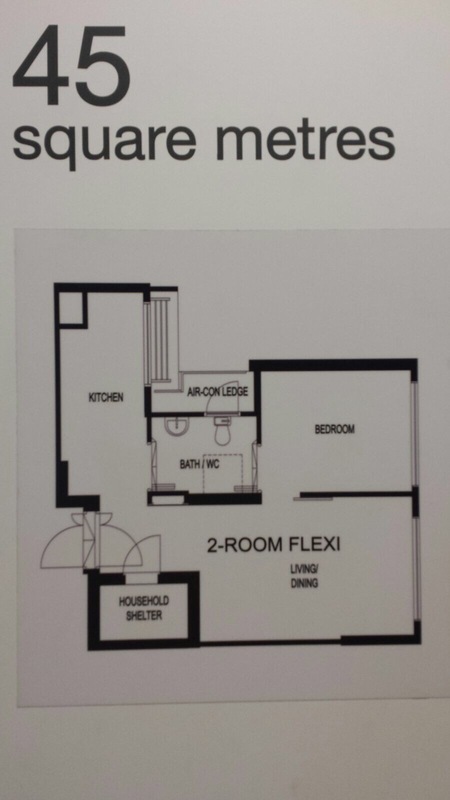 The above illustrates the vast differences in our costs of living separated by only a narrow waterway. I can hear that some of you shouting their pay is so much lower than us. Well that’s true. My friend Walter from EM ever told us that his wife’s niece, a fresh graduate from KL university earning around RM2,800 working in an office which is even less than our cleaners earning more than S$1,000. What about the other lesser universities or those without any university education? Wonder no more why so many of them are crossing the border each day to seek employment here. 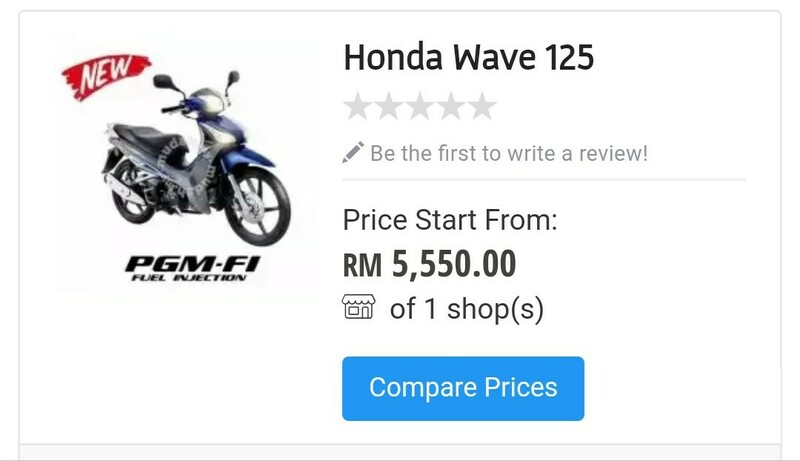 Yup, we live in the system and we are so used to such ridiculous prices tantamount to “daylight robbery!” I’m not against COE per se but at such ‘Gila’ price of more than S$12,000 for the same bike model with a 10 year life span? Come on. It’s logic defying especially when there is only ONE COE category for motorcycles when there are so many for 4 wheelers. The limited COEs are quickly snapped up by big corporations such as Macdonalds, Piza Hut, SingPost etc etc pushing up to dizzling high levels beyond the reach of the ordinary shift workers, despatch riders or the newspaperman. 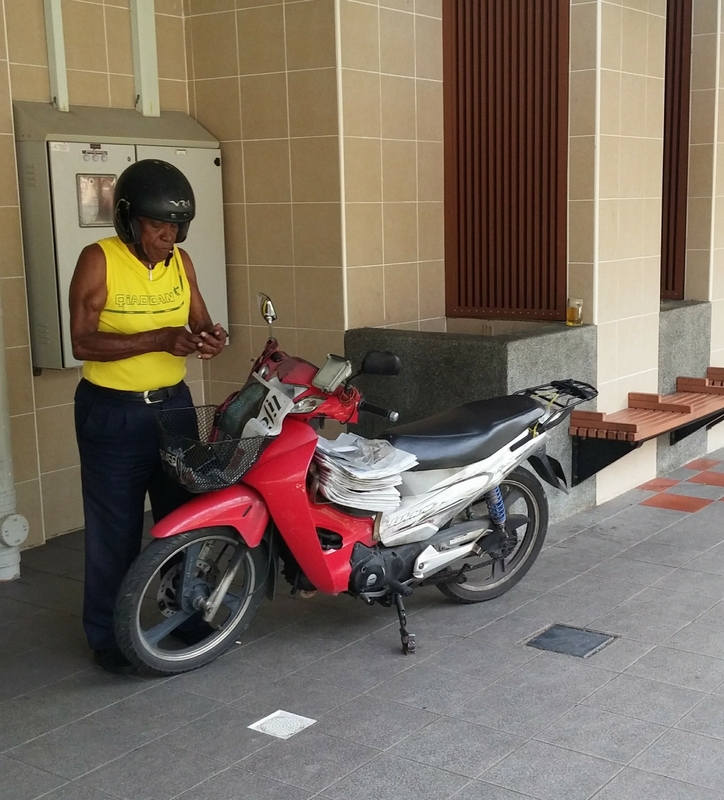 In some ulu places where public transport is not easily accessible, these shift workers need to get to their work places on their bikes. What about those depending on small bikes to make an honest living. The rich will never ride a 125cc Honda Wave. They only ride big luxury bikes but pay the same amount of small bike COE. These poor workers are priced out by the rich guys and big corporations snapping up all the available bike COEs! Nobody takes notice of the little people. Maybe once in 5 yrs their existence is only recognized? We may be earning much higher than our counterparts across the border but do we have the buying power as them? I’m only quoting bike COE and the maintenance costs to drive home my points. What about foodstuff, utilities, education, medical and housing etc. With car-lite society being the mindset now and with so many more buses choking the roads, some say that car COE will eventually hit $100K with bikes at $10K. We may be earning more than those in the north but many of us can’t even afford to buy a small motorcycle. That’s the future economy we should expect lah! We have changed so fast over the years. When I cross the border, I could sense the much slower pace of life. We can never go back to those good old days when our pay was low but life was quite comfortable and affordable then. When I was driving taxi, many of my pax from 1st world big cities also complained about our expensive city. It’s too expensive to visit here. They would rather go to our neighboring countries where they are so much cheaper and less restrictions. They could drink till the wee hours unlike here. No night life after 10.30pm. It becomes a dead city after that cut-off time. Wonder no more why there are tons of empty cabs roaming the streets in the middle of the night. That my friend is the future economy we will have to live with as far as common people like you and me are concerned. Hi bro…i recently sold off my 1.8 L nissan sentra for $4k and bought a 2.4 L AWD honda crv for $4.2k. Spent $500 to fix the knock sensor, transmission pressure switch and replaced brake pads. Needed it to accommodate my grown up kids. Planning on a road trip to the rockies, calgary and edmonton in alberta in aug when ben returns. For less than $5K you could get a good quality big car! Here can’t even pay for bike COE! Bike COE is $6.4K now! WTF? Yup. I’m sometimes tempted to migrate over to your place. But my love for my country over rides everything else!